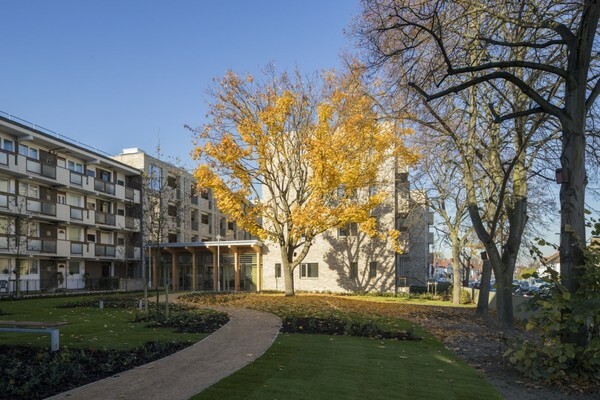 Hazelhurst Court is an award-winning development of 60 extra care apartments for older people, completed in October 2017. Designed by Levitt Bernstein the scheme offers generous communal spaces including a garden room, cafe and landscaping. 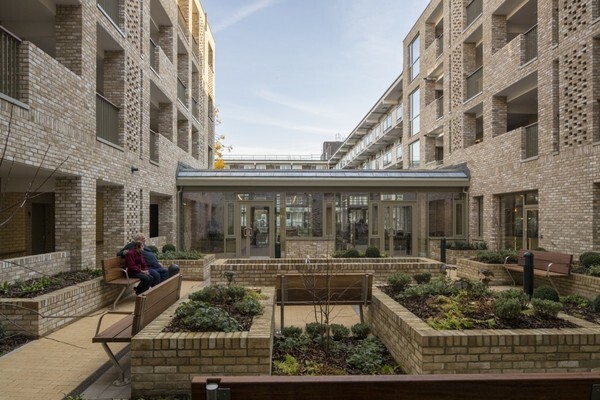 This project provides 100% affordable homes for older people with extensive communal spaces. Working around an existing 1960s flat block, the scheme features two buildings and two courtyards, with a garden room providing a light-filled communal space directly onto the external areas. Being mindful that older people spend more time inside, the design is centred on the concept of bringing the outside in. All homes are dual aspect to provide a visual connection to the courtyards and neighbouring streets, whilst planters in front of kitchen windows add to the sense of greening and offer opportunities for growing and personalisation. In 2014, Phoenix Community Housing (PCH) identified Hazelhurst Court as an opportunity to provide new homes for their older residents on an underused site, and in turn, free up larger homes for local families. Levitt Bernstein’s challenging brief was to integrate 60 new homes and facilities on a constrained site, adjacent to a 1960s PCH flat block. 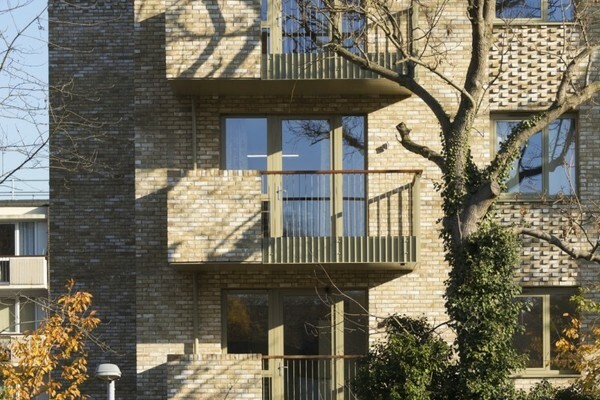 As well as maximising the provision of new homes, they needed to create communal spaces that could be enjoyed by all residents – regardless of where they live in the development, or their physical and mental health. As a resident-led organisation, PCH engaged extensively with existing and new residents, in addition to its own stakeholders and members, as proposals developed. Being closely involved in this process, many of the discussions at consultation events informed elements of the project’s design. The scheme comprises two new buildings. The first adjoins the existing block, forming a horseshoe around a new intimate courtyard, whilst creating a new edge to an existing underused green space to form a second, more open, softer courtyard. Another smaller building sits opposite, separated by a newly landscaped street. Being mindful that older people spend more time inside, the design is centred on the concept of bringing the outside in. All homes are dual aspect to provide a visual connection to the courtyards and neighbouring streets, so that even if residents aren’t able to go outside much, they benefit from seeing activity in these spaces. Planters located on access decks in front of kitchen windows add to the sense of greening, whilst offering the opportunity for home growing and personalisation. Similarly, a new garden room provides a generous, light-filled communal space between the two courtyards. Featuring a lounge, dining room, café, commercial kitchen and TV suite, this hub accommodates a whole host of activities for both new and existing residents. The chequerboard effect created by the strong grid of the elevations extends into the landscape, with the enclosed courtyard featuring a fish pond, seating areas and planters at different levels to form a rhythm and geometry across the space. The larger courtyard is much more open in nature, comprising a walking loop, patio and trees to provide physical and visual stimuli. A street at the heart of the development ties all of the new and existing elements together – its shared surface simultaneously aiding those with mobility issues and reducing the dominance of the car. All areas of the scheme are level to facilitate easy movement and care has been taken with wayfinding for residents with dementia.